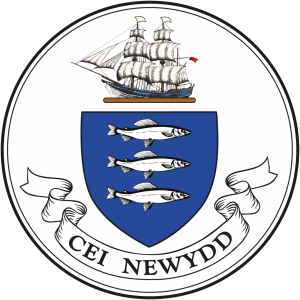 About New Quay (Cei Newydd): it is a seaside town in Ceredigion, Wales with a resident population of around 1,200 people. Located on Cardigan Bay with a harbour and large sandy beaches, it remains a popular seaside resort and traditional fishing town. Until the early 19th century, New Quay consisted of a few thatched cottages surrounded by agricultural land, the natural harbour providing a safe mooring for fishing boats and a few small trading vessels. The New Quay Harbour Act was passed in 1835 and a stone pier was constructed at a cost of £7,000. Trading activity increased and new houses were built as economic migrants arrived. Shipbuilding began to take place and the town increased in size with the construction of terraced housing up the slopes of the sheltered bay. By the 1840s, more than three hundred workmen were being employed in shipbuilding in three centres, New Quay itself, Traethgwyn, a bay just to the north, and Cei-bach, a pebble beach further north below a wooded cliff. Here smacks and schooners were constructed for sailing along the coast, also larger vessels for sailing to America and Australia. At that time, as well as shipwrights, New Quay had half a dozen blacksmith shops, three sail makers, three rope walks and a foundry. Most of the male inhabitants of the town were mariners or employed in occupations linked with the sea. By 1870, shipbuilding had ceased at New Quay but most of the men living there still went to sea. There were navigation schools in the town and many of the last square riggers that sailed the world were captained by New Quay men. The observant tourist can still see the old warehouses, now put to new uses, lengths of chain, metal rings and capstans, and a list of tolls for exports and imports can still be seen outside the harbourmaster‘s office. Key attractions for holidaymakers include the picturesque harbour and expansive sandy beach, as well as the ability to see the population of bottlenose dolphins that live in Cardigan Bay. The town has a heritage centre and marine wildlife centre, as well as the usual collection of shops and restaurants. Nearby New Quay Honey Farm, the largest bee farm in Wales, has a live bee exhibition and sells honey, mead and beeswax. The outskirts of the town feature many large holiday parks and caravan sites. The annual Cardigan Bay Regatta, usually in August, has been conducted since at least the 1870s. Events now include inshore sports (swimming, rowing, etc.) and dinghy and cruiser racing. In addition to the hospitality industry, there is still significant employment in sea fishing and fish processing.